Blame it on the barbeque ― a super-size stainless steel number that caught Jordan Rubin’s eye. It needed a place to park outside the Seattle home Jordan shares with his wife, Leanne. The only question was where; the Rubins’ sole outdoor space was a lifeless rectangular parking pad of concrete, gravel, and asphalt next to their busy street. There was no fence for privacy, and no plants to soften the landscape. So the couple ― first-time homeowners with only the scantiest experience in construction, design, and gardening ― decided to convert part of that parking pad into a courtyard for summer dining and entertaining. They drew inspiration from books, magazines, and gardens they spotted during evening walks around their neighborhood. “We did the design by pacing the space and laying down strings and hoses,” Leanne says. The couple planned to build tasteful fencing across the back of the driveway to create a private 33- by 25-foot outdoor room, which they would pave with Pennsylvania bluestone. 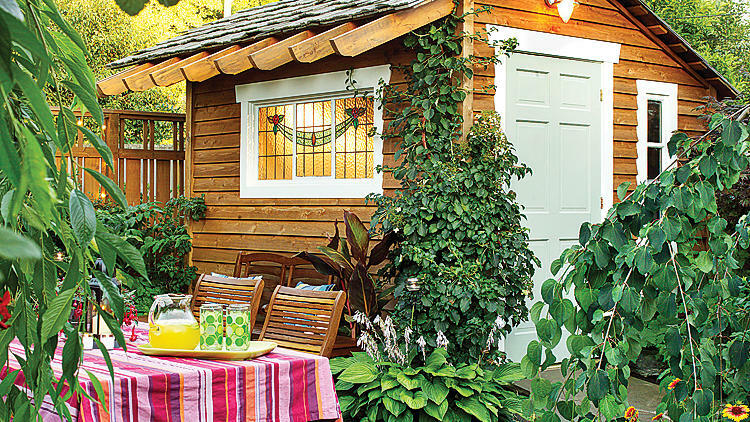 Finally, they envisioned adding a sheltering screen of greenery, a garden shed, and a dining area. But the process of building the new garden turned into an adventure with a few unforeseen twists. See more about the couple’s year-long labor of love here. Leanne Rubin selected plants recommended by the Great Plant Picks program at Seattle’s Elisabeth Carey Miller Botanical Garden. The Sunset Plant Finder lets you search for plants by your Sunset climate zone and special needs and preferences. Other good sources for recommendations include All-America Rose Selections; 415/249-6776, the Plant Select list for mountain and intermountain areas, and All-America Selections for garden seed. Each organization lists plants meeting stringent performance standards. Leanne put water-loving plants in one part of the garden and drought-tolerant ones in another, so watering (all done by hand) is easier and plants grow better. Solomon’s seal, Epimedium, and hostas grow in the shady areas, while a blend of grasses, Ceanothus, and a strawberry tree goes in drier, more exposed places. Each autumn, the Rubins put down a 2-inch layer of compost made from recycled garden waste. It adds nutrients to the soil, protects roots from hard freezes in winter, conserves water in summer, and keeps down weeds all year. It keeps tools and garden machinery safe, dry, and out of the garage and basement.